John Perkins is a hero of the faith. I have little doubt that within a few decades he will be featured in biographies written for children as an example of someone who did a great work for the glory of God. His is far from a household name in many circles, unfortunately. In fact, it has only been in recent years that I’ve encountered his story which typically isn’t flashy, but exudes the powerful, life-changing reality of the gospel. For those new to John Perkins’ story, he is an African American man from Mississippi. If that doesn’t tell you enough, know that his brother was killed by police officers decades ago, he himself was severely beaten while in police custody, and his son suffered mightily as one of the forerunners of the school integration efforts in the ‘60s. This is a man who has every reason to be bitter, angry, and to despise whites. He’s been given reason upon reason to reject the offers of reconciliation and partnership from the ethnic groups who were responsible for so much of his pain. He has not reacted that way, though. Perkins came to Christ as the result of his son’s invitation to attend Sunday School. Hearing the gospel turned his heart away from the natural bitterness of his experience and led to the changed heart who has influenced many for Christ. It also set in motion the work Perkins has done in making society more just. 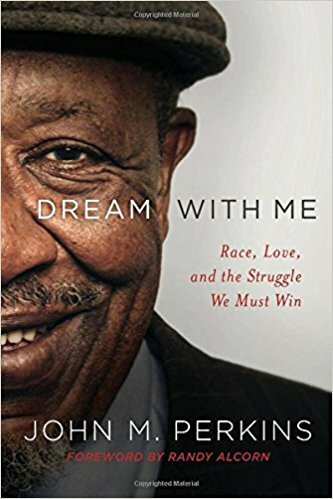 His recent book, Dream with Me: Race, Love, and the Struggle We Must Win, is an autobiography. At 86 years old, Perkins offers this book as a self-conscious reflection on how God has worked in and through him for decades. The volume has fourteen chapters, which move in roughly chronological fashion. The chapters are thematic, telling pieces of Perkins’ story, along with a great deal of thoughtful reflection along the way. Like most autobiographies, the best parts of this book are not the histories that he recounts, but his explanation of his perspective. Listening to an aging man explain why he did some things and not others, and what he would have done differently is pure gold. This is distilled, bottled wisdom for those who are fortunate and diligent enough to read it. One of the most powerful aspects of this book is Perkins’ reflection on some of the sources of the vicious discrimination African Americans faced prior to and during the civil rights movement, when public displays of racism were tolerated and encouraged. Perkins notes that some of the worst racial violence came from poor whites in the South—people who were in much the same economic straits that many blacks were in during that time. However, those poor whites had something that the blacks didn’t—white skin. Instead of commiserating and cooperating with people in similar economic straits, some poor whites cashed in on the only asset they possessed—the cultural cache of being white—using it to gain positions of relative power, like prison guard, deputy sheriff, etc. They also took opportunities to reinforce their “superiority” over people of color, living out the idea that pushing someone else down could lift them up. The reality, of course, is that such actions simply made everything worse for everyone. Perkins is able to reflect on this condition retrospectively with grace. He’s a better man than I am, I’m sure. Instead of being angry about how poorly he was treated and how much pain many whites caused his family and friends, Perkins demonstrates a gospel-fueled love. That’s a big piece of Perkins’ life message and the message of this book. Love, the sort of love that comes from the regeneration of hearts by the love of Christ and the power of the gospel, has the power to change things. It’s easy to forget that. Or, perhaps it’s hard to believe that when crowds are shouting at you, death threats are coming, and you simply want the equal justice the law requires. In Dream with Me, Perkins gives an example of what it looks like. I’m not always a fan of autobiographies, but this is a book that deserves to be read. It will serve as an encouragement and lodestar for many engaged in the slow moving process of gospel reconciliation.